Result? As my first try, the recipe was easy to follow and it turned out great. I had to turn up the temperature slightly bit to get the golden brown crust, and we didn’t use the entire amount of butter. It smelled wonderful and texture was moist and dense, and flavour was good. Mr. was a happy boy after taking his first bite. 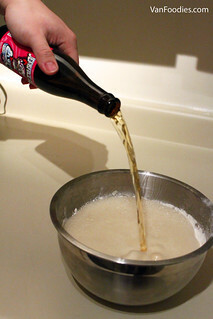 Then, we had this wild thought – what if we try the recipe with a darker beer? Like, stout? It would be richer, more flavourful…so it would be better, right? So we gave it a shot. The only stout we had at home was the St. Ambroise Oatmeal Stout and that’s what I used. The batter was much darker in colour. I also sprinkled some brown sugar on top before I drizzled the melted butter. Other than that, I followed the rest of the recipe. Wow the bread had this deeper brown colour, and a crunchier crust thanks to the brown sugar. The flavour was richer, more complex, almost had this chocolaty, malty note to it. 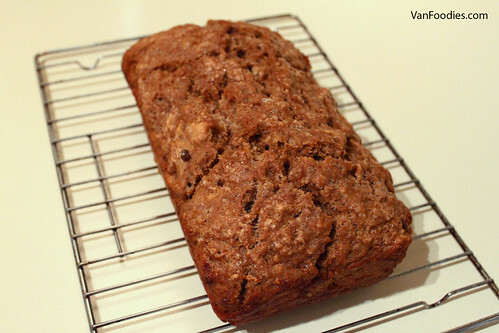 We much prefer this adaptation of the recipe, so I went on to further improve it to our liking. We even took it to our beer club meetup and the gang really enjoyed it! And here’s the revised recipe using stout and brown sugar for a more complex flavour. It’s great to go with soft cheese and fruit preserve. We had it with some fig goat cheese and it was delicious! In a mixing bowl, combine the flour, baking powder, granulated sugar, brown sugar and salt. Add the stout all at once, mixing as little as possible. The batter should be lumpy. Use some butter to coat the loaf pan. 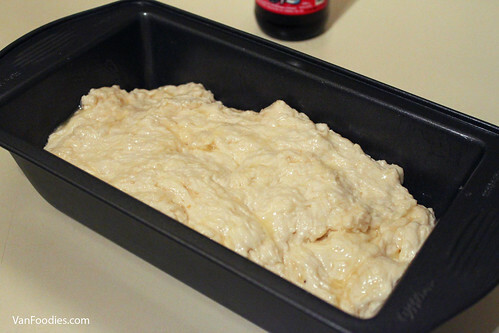 Pour the batter into a loaf pan, sprinkle some brown sugar on top and drizzle the melted butter evenly. Bake in the oven on the middle rack for 35 minutes, then turn up the temperature to 400F and bake for 5 more minutes or until an inserted skewer comes out clean. Take it onto a rack to cool. This recipe is very easy to make and there’s some room for creativity when it comes to beer choice. I think I will try it with a few more kinds of beer to see if there’s an even better option. Nitro, maybe? How about fruit beer? Possibilities are endless here! I love using beer in breads! I home brew so I do quite a bit of experimenting myself. You’ve inspired me! Thanks for sharing! 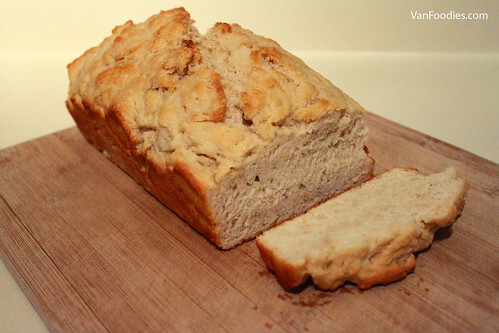 Never made beer bread but now I’d like to try! I like the color the stout gave the second loaf. It sure looks delicious! I think I would have liked the stout version best, too. I suspect that using great beer, as you did, makes for a better bread than those olden-day choices.